← What is Metabolism Anyway? When I was diagnosed with Dry Eye Syndrome, my immediate response was to research the condition in order to learn how to best address the symptoms I was experiencing and, most importantly, support my long term eye health. I knew that I wanted to continue to wear contact lenses and I needed to be comfortable while sitting in front of a computer screen all day. What I found surprised me. For instance, I didn’t know that the tear film actually consists of three layers with each layer having its own purpose. The oily layer on the outermost surface of the tear film smooths the tear surface and helps prevent evaporation of tears. The middle watery layer cleanses the eyes and washes away irritants or foreign particles. The inner mucus layer helps to spread tears across the eye surface and helps keep the eyes moist. Tears consist of proteins, electrolytes, and nutrients that are critical to maintaining the health of the eye surface. If you have ever been diagnosed with dry eye, you are well aware how uncomfortably irritating dry eyes can be. Normally, the eyes produce tears at a slow and steady rate, moisturizing the eye surface with every blink to keep the eyes comfortable. Aqueous tear-deficient dry eye occurs when the eyes fail to produce enough tears to properly maintain a healthy eye surface. Evaporative dry eye occurs when tears evaporate too quickly. This is generally the result of inflammation of the glands that produce the oily part of tears that would normally slow the evaporation and keep the tears stable. Sometimes, the eyes just don’t produce the right quality of tears necessary for eye comfort. I also found that I wasn’t alone, as nearly 5 million Americans over the age of 50 experience eye dryness, with women almost three times as likely as men to develop the condition. Dry eye syndrome can be age-related, a side effect of medication, or can be caused by allergies, pregnancy, inadequate nutrition, medical conditions, and long term contact lens wear. Though it may seem strange, people with dry eyes may find that their eyes water excessively. This is the result of the eyes responding to the discomfort, which can include stinging or burning, scratchiness, grittiness, excessive tearing, fatigue, and a decreased tolerance for sustained visual activity, such as reading or working on the computer. Normally, I like to take a natural or functional approach to treating any illness or health condition. However, I also look at conventional treatment and consider all my options. I found that the treatment of dry eye largely consists of addressing the symptoms of the ongoing condition. Conventionally, after ruling out any underlying medical causes of dry eye, an anti-inflammatory medication can be prescribed. While this medication usually helps to reduce the symptoms of dry eye, it can take as long as three to six months of twice daily dosages before the medication takes effect. Another option was to give up wearing contact lenses, something I definitely did not want to do if at all possible. Another suggestion included using artificial tears as the first line of therapy to provide temporary relief and replace naturally produced tears. For me, these were simply not ideal solutions and I was looking for something more. About two years ago, I discovered BioTears®, a nutraceutical manufactured by BioSyntrx. Even though I technically still have the condition, I have been comfortably symptom free during this time. I still wear contacts although I am careful not to abuse the privilege, and I still work at the computer, but remember to look away and take occasional screen breaks. Honestly, what prompted this article was the fact that I got complacent about taking the supplement. 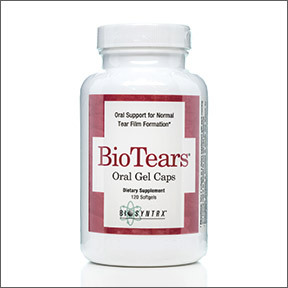 I was traveling for a week and in all the busyness of visiting my very large family, I neglected to take the BioTears®. And admittedly, I didn’t immediately get back into the habit for another week after I returned. And by then, wow! The dryness, the grittiness, the irritation and watery eyes came back with a vengeance! Getting back on track, it only took a few days of supplementing with BioTears® for my symptoms to abate and eye comfort to return. I really learned a good lesson. Dry eye syndrome may be ongoing but the symptoms can be easily managed. I decided to take another look at why BioTears® works so well for me. BioTears® was scientifically designed and is biochemically balanced with natural ingredients that support fatty acid metabolism, as well as the structure and function of all three layers of the tear film. This synergistic formula supports normal production of eye lubricants along with ocular surface health, and modulates the surface tension of the tear film that affects the comfort of contact lens wearers, like me. Along with other supplements that I regularly take to support overall health and wellness, BioTears® stands out as one supplement that I will not neglect to take again. If you have been diagnosed or have symptoms of dry eyes, I highly recommend BioTears®. It has helped me tremendously. It can help you, too! BioTears® by BioSyntrx – BioTears® uniquely addresses the underlying inflammatory processes associated with dry eye syndrome. Along with vitamins A, C, D. E and B6, BioTears® provides EPA, DHA, green tea and curcumin to safely and satisfactorily relieve the common symptoms of dry eyes including dryness, irritation, grittiness and often times, excessive tearing. This entry was posted in Home and tagged BioTears by BioSyntrx, Dry Eye Syndrome – A Personal Perspective, Professional Supplement Center, Vitamins and supplements, www.professionalsupplementcenter.com. Bookmark the permalink.